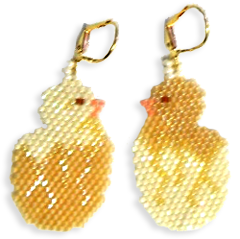 Chick Earrings match Ronit&apos;s Spring Chickens Bracelet. These chicks are still emerging & have a way to go! Brick stitched earrings are about 1½" when using size 11 Delicas.